, a very distinguished musician in the last century, was born at Naples May 11, 1735, according to one account, but Dr. Burne}^ says 1727. 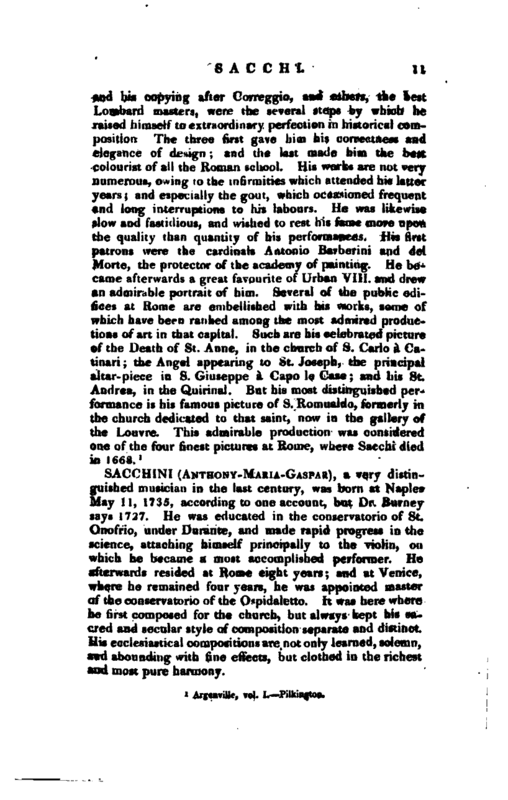 He was educated in the conservatorio of St. Onofrio, under Durante, and made rapid progress in the science, attaching himself principally to the violin, on which he became a most accomplished performer. He afterwards resided at Rome eight years; and at Venice, where he remained four years, he was appointed master of the conservatorio of the Ospidaletto. It was here where he first composed for the church, but always kept his sacred and secular style of composition separate and distinct. His ecclesiastical compositions are not only learned, solemn, and abounding with fine effects, but clothed in the richest and most pure harmony. 1 ArgenviHe, vol. I. Pilkington. | His reputation increasing, he visited, by invitation, some of the courts of Germany, and among others those of Brunswick and Wittemberg, where he succeeded the celebrated Jomelli; and after having composed for all the great theatres in Italy and Germany with increasing success, he came to England in 1772, and here supported the high reputation he had acquired on the continent. 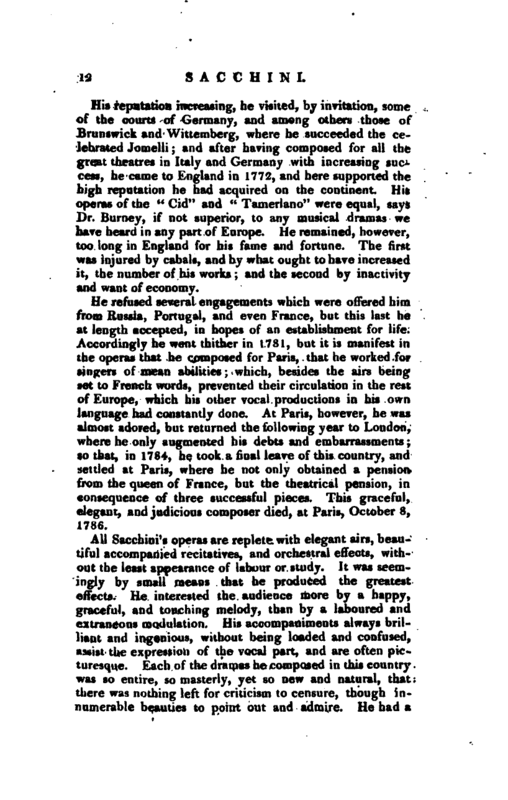 His operas of the “Cid” and “Tamerlane” were equal, says Dr. Burney, if not superior, to any musical dramas we have heard in any part of Europe. He remained, however, too long in England for his fame and fortune. The first was injured by cabals, and by what ought to have increased it, the number of his works; and the second by inactivity and want of economy. He refused several engagements which were offered him from Russia, Portugal, and even France, but this last he at length accepted, in hopes of an establishment for life. A-ccordingly he went thither in 1781, but it is manifest in the operas that he composed for Paris, that he worked for singers of mean abilities; which, besides the airs being set to French words, prevented their circulation in the rest of Europe, which his other vocal productions in his own language had constantly done. At Paris, however, he was almost adored, but returned the following year to London, where he only augmented his debts and embarrassments; so that, in 1784, he took a final leave of this country, and settled at Paris, where he not only obtained a pension from the queen of France, but the theatrical pension, in consequence of three successful pieces. This graceful, elegant, and judicious composer died, at Paris, October 8, 1786. All Sacchini’s operas are replete with elegant airs, beautiful accompanied recitatives, and orchestral effects, without the least appearance of labour or study. It was seemingly by small means that he produced the greatest effects. He interested the audience more by a happy, graceful, and touching melody, than by a laboured and extraneous modulation. His accompaniments always brilliant and ingenious, without being loaded and confused, assist the expression of the vocal part, and are often picturesque. Each of the dramas he composed in this country was so entire, so masterly, yet so new and natural, that there was nothing left for criticism to censure, though innumerable beauties to point out and admire. 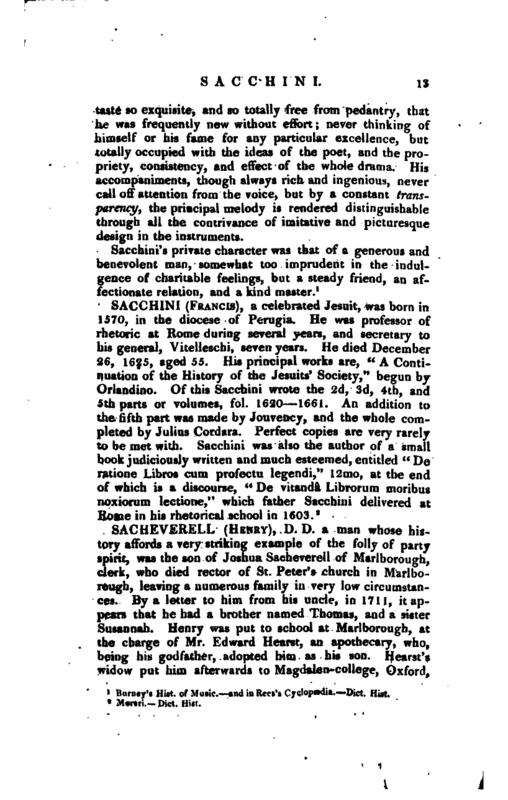 He had a | taste so exquisite, and so totally free from pedantry, that he was frequently new without effort; never thinking of himself or his fame for any particular excellence, but totally occupied with the ideas of the poet, and the propriety, consistency, and effect of the whole drama. His accompaniments, though always rich and ingenious, never call off attention from the voice, but by a constant transparency, the principal melody is rendered distinguishable through all the contrivance of imitative and picturesque design in the instruments. Buruey’s Hist, of Music. and in Rees’s Cyclopædia. —Dict. Hist.